Can Anyone Learn Tai Chi and Benefit from It? The Chinese mind-body exercise system of Tai Chi has become popular all around the world as an alternative healing method with many physical, mental, and spiritual benefits. 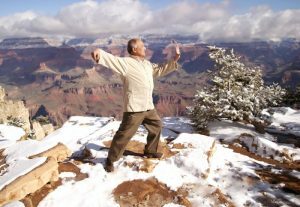 Many stress-weary and disease-ravaged individuals want to take up Tai Chi to improve the quality of their lives and keep healthcare costs in check. Can Anyone Learn Tai Chi? But can anyone learn Tai Chi? Yes, Tai Chi can be learned by people of any age and physical ability. Tai Chi consists of a series of slow, gentle, and flowing movements performed without pauses. You have to breathe deeply during the routine, align your breath with each posture, and be mindful of your movements and bodily sensations. 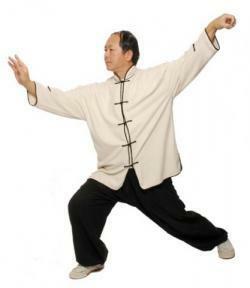 The movements in Tai Chi are gentle, so the muscles remain relaxed. The joints are also not stretched to their limits or bent in difficult angles. The nature of Tai Chi movements makes this practice safe for people with a wide range of physical conditions and fitness levels. You can take up Tai Chi even if you were leading a sedentary life for as long as you remember! Unlike Yoga, Tai Chi does not consist of postures that lock the joints. This makes it suitable for people suffering from arthritis or chronic back pain. The movements are slow and do not exert force on the bones and joints. This prevents wear and tear of muscles. The chances of sustaining an injury when doing Tai Chi are almost nil. So Tai Chi is ideal for the elderly who may not lead very active lives or frail people. Tai Chi routines can be customized to suit the needs of someone who uses a wheelchair. Because the movements are relaxed and the routines are not tiring, Tai Chi can also be learned by individuals recovering from an illness or a surgery. You do not need fancy equipment or special workout gear to practice Tai Chi. So learning Tai Chi is not expensive. The routines are self-paced, and you can fit Tai Chi into your busy life effortlessly. Tai Chi is generally safe for all. But to ensure you do not get hurt accidentally during a routine, do some warm-up exercises before you begin. Rock back and forth gently, turn your head slowly from one side to the other, and move your shoulders in small circles. Wear comfortable clothes and a pair of flat-soled shoes for your routines. Although Tai Chi can be learned by almost anyone, pregnant women and people suffering from severe osteoporosis, fracture, and hernia should consult a doctor before taking lessons. Also inform your instructor if you have joint problems or back pain, so he may customize your exercises. Tai Chi won’t interfere with your medicines or hectic schedule. It won’t stress out your bones and joints that may have been idle for too long. You also don’t need to be an athlete to learn Tai Chi. Tai Chi is for everyone. With healthcare costs skyrocketing by the day, it is a safe, economical, and hassle-free way to take charge of your health and wallet, and earn your peace of mind. Can anyone learn Tai Chi? Absolutely! Sources on: Can anyone learn tai chi?